Editor’s Note: This is a guest posting by Rich Jarzombek. I’m always fascinated by what I call “The Infinite Powers” of fractals. 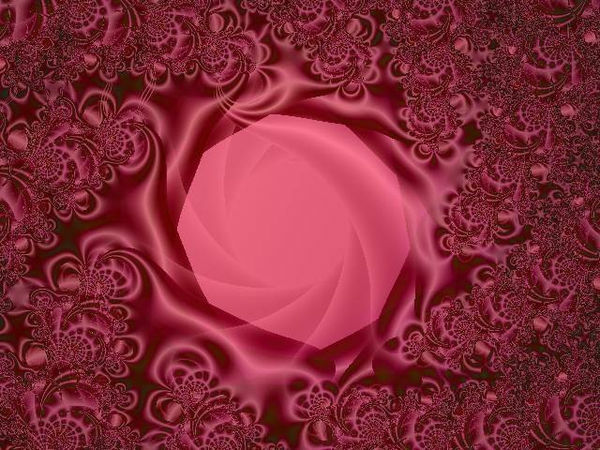 Most fractalists know that the fractal computational process is iterative and therefore could go on to infinity but intentionally terminates when a programmed condition is reached so that an image existing at the time of that terminating condition can be displayed. 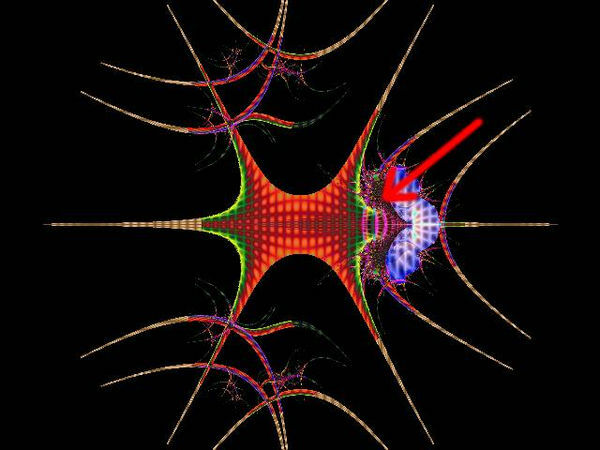 While I know that fractalists are aware of this “Infinite Computational Power” I suspect that few make adequate use of fractal’s “Infinite Magnification Power”. Personally, I find great satisfaction in utilizing this “Infinite Magnification Power”. 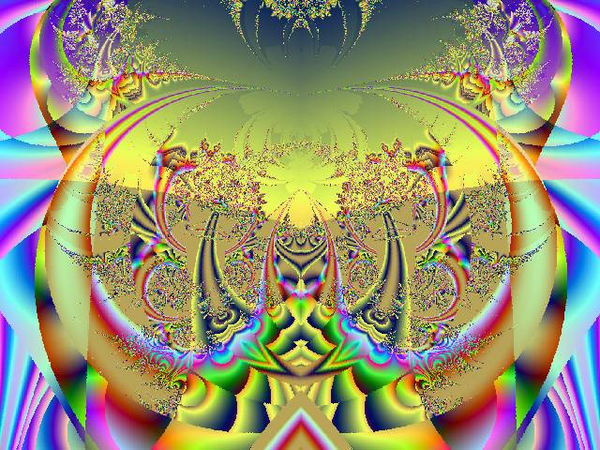 In fact, all of the 1200+ fractals in my website, Realistic Fractals, http://realisticfractals.com were produced at high magnifications, typically several hundred to several thousand times standard (default) magnification. This means that most of my images didn’t exist as even a single pixel in the initial display! The following example shows the result of one of my earliest ventures into high magnification. The image below was derived from an equation of my own creation. It is displayed at 1.0 initial magnification. When I saw this image my immediate reaction was, “Who woulda thunk it?!!”. 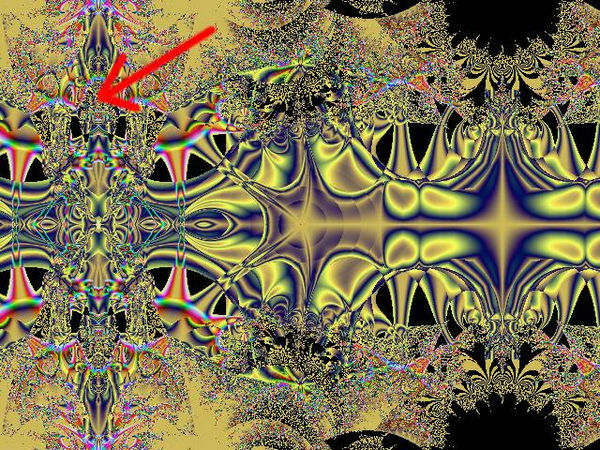 The significance is that even within an ugly fractal there may exist a beautiful image if you take the time to explore using the “Infinite Magnification Power” of fractals. As an analogy of this degree of magnification, if this image were viewed at a width of 6 inches, its primary fractal would have a width of 6 miles and contain 4 billion different images of the same size! The following example shows the result of an experiment to determine the maximum magnification capability of the software based on its computational precision (significant figures). The image below was derived from an equation of my own creation. It is displayed at 1.0 initial magnification. I then chose to magnify a pinpoint location in the area to which the arrow points. After a series of magnification I reached a magnification of ‘ten to the thirteenth power’ and the image below appeared. This image is not displayed to show esthetic value but rather to show its sharp detail even at such high magnification. (Any higher magnification will result in a distorted, highly pixelated image due to exceeding the system’s mathematical precision.) If this image were viewed at a width of 6 inches, its primary fractal would have a width of 10 times the average distance of the earth to the sun, and would contain ‘ten to the twenty-sixth power’ different images of the same size!! Due to this analogy I gave it the title, “Alien Horizon”. Since it is difficult to imagine what ‘ten to the twenty-sixth power’ images means, I decided to compute another analogy: If these images were divided evenly to the entire world’s population of 6.8 billion, and if everyone took only one second to view an image while working on a 24/7 basis, it would take over 400 million years before all the images were viewed! (Unfortunately, this would also be about the same amount of time that “traditional” artists will take to accept the fact that “Fractal Art” is a “legitimate” art form!). Sometimes I like to think that every fractal image I initially create is imprinted on an enormously huge microscope slide. Therefore I am looking through a microscope with the ability to move the slide to any position I choose and view whatever is there, and at any magnification I choose! Wow! Can’t you just feel the awesome energy of fractal’s “Infinite Magnification Power”?! !